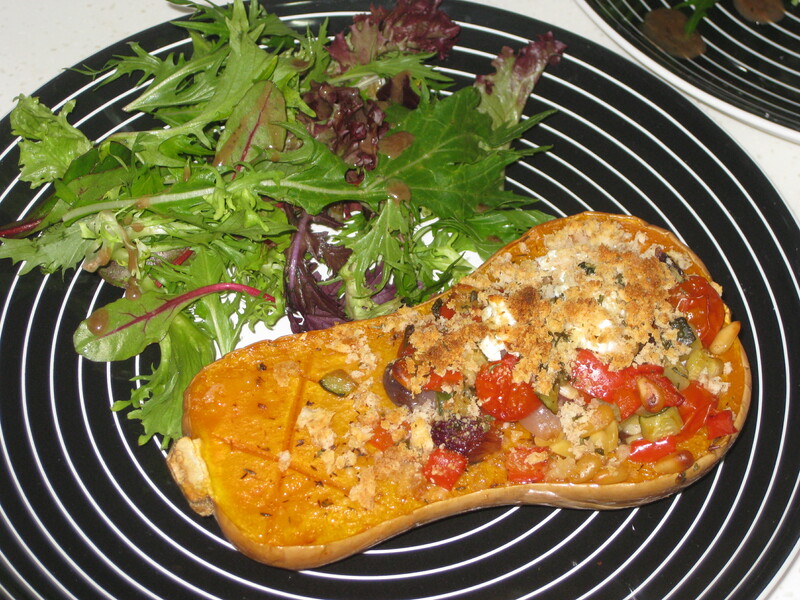 I distinctly remember being 16 years old the first time I encountered a butternut squash – my mum had just got the Good Housekeeping Vegetarian cookbook and returned from Tesco with this funny looking vegetable. Since then, it has gone on to become one of my favourite vegetables and one that I use a great deal in cooking, though it can be rather difficult to come by – I don’t think I ever saw one while I lived in Vietnam; I remember the thrill of the new organic shop near my flat in Italy occasionally having them in, imported from Argentina; and here in Hong Kong they’re only available at overpriced western supermarkets. In my opinion they are well worth splashing out on, especially when they get to be the main focus of the dish as in this case. This is a really colourful and sophisticated dinner for two, which I’ve even served for Christmas dinner before. It actually looks fancier than it really is too – it’s easy to make, but looks like it ought to be more challenging. 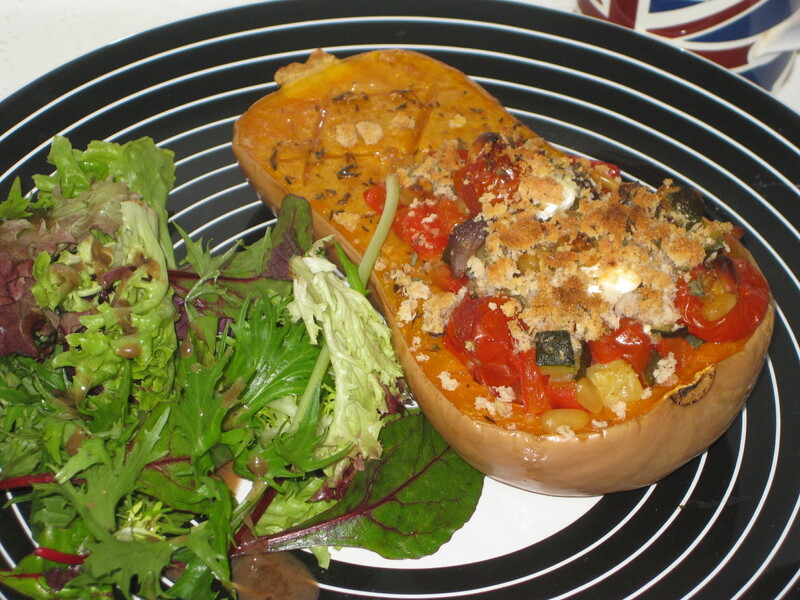 The vegetables are really juicy, and then you stumble across a creamy chunk of goats’ cheese, then the crunch of pine nuts, and it’s all held together with the lovely sweetness of the squash infused with garlic, thyme and a bit of heat. It’s just lovely. 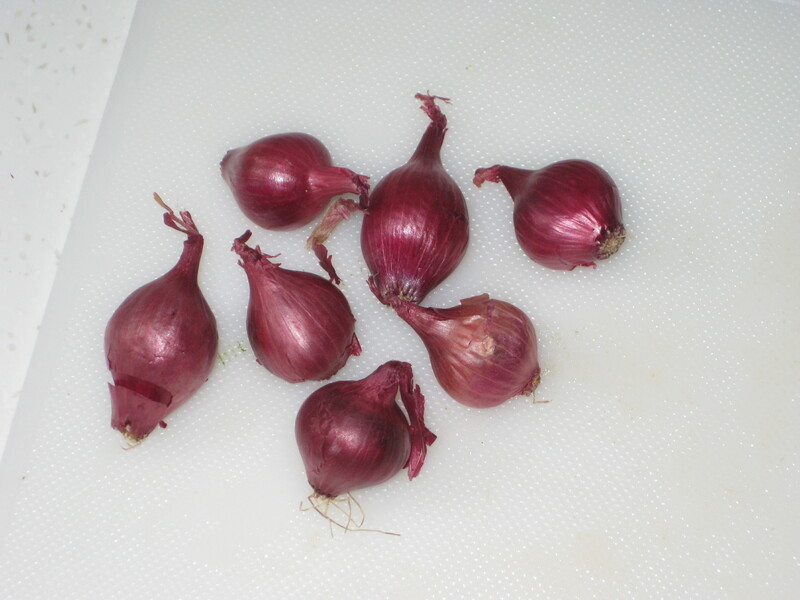 I found these tiny pearl red onions, which worked beautifully – using a regular onion can be rather overpowering, and it’s virtually impossible to cut it into wedges small enough to fit in the hollow. These little pearls were perfect in that regard, just the right size and a really tasty mouthful. 1. Preheat the oven to 200C. 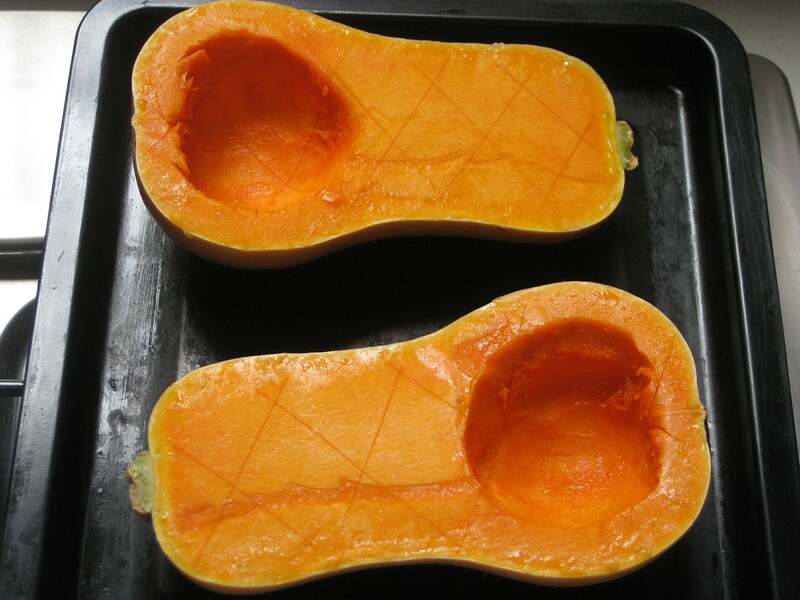 Cut the squash in half, scoop out the seeds and cut diagonal criss-cross patterns over the cut side of each half. 2. 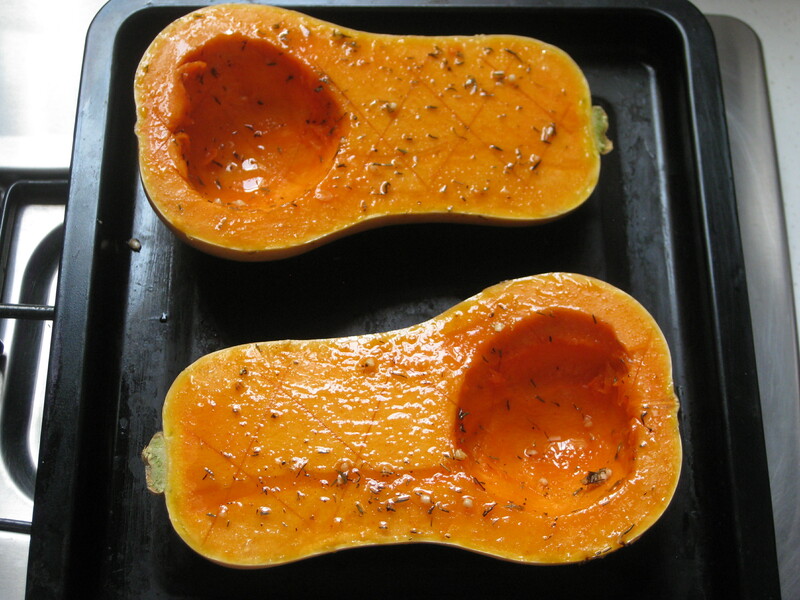 Mix together the garlic, 1 tbsp oil, chilli and thyme, then brush this mixture over the flesh of the squash. Bake for 30-40 minutes until tender. The oil sometimes pools in the hollow – just spoon it out after cooking. 3. 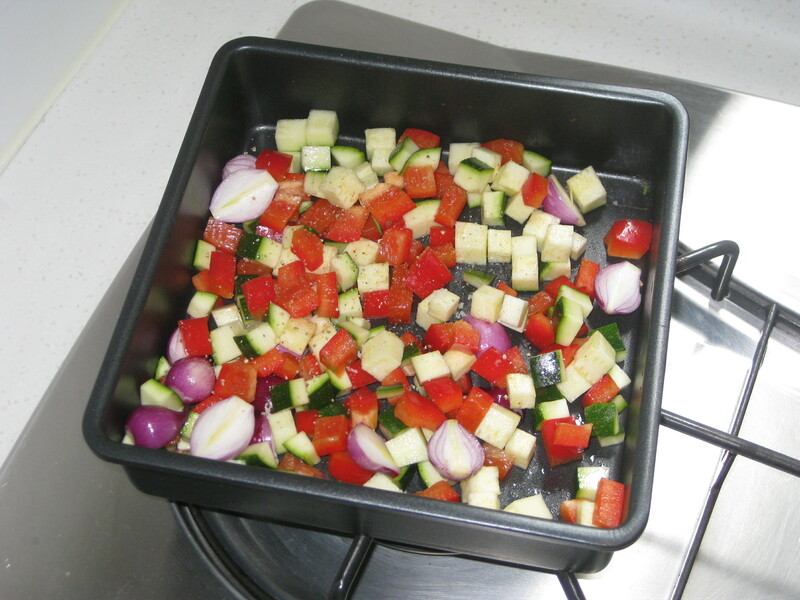 To make the filling, put the chopped pepper, courgette and onion in a roasting tin and coat well with the remaining 1/2 tbsp oil. Season well, and roast for 20-25 minutes until tender. 4. Add the cherry tomatoes and pine nuts, and return to the oven for a further 10 minutes. 5. 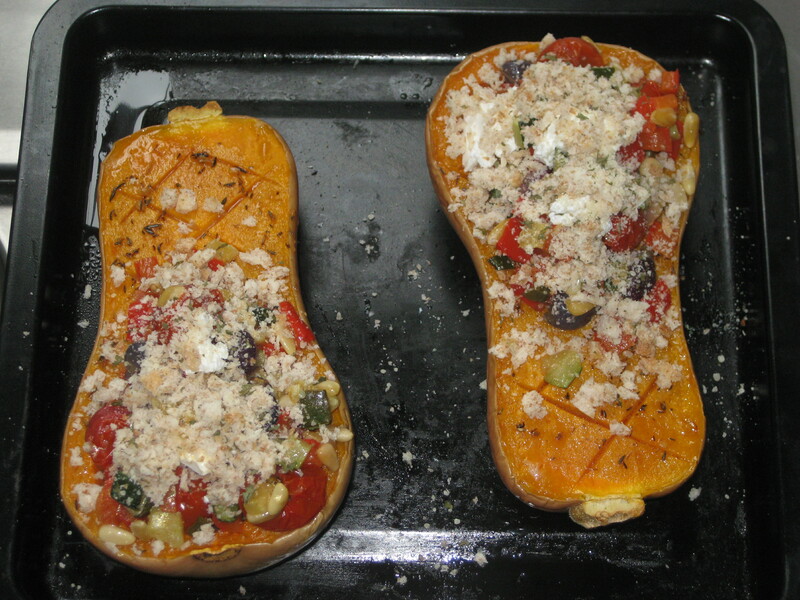 Pile the roasted vegetables in the squash halves, adding chunks of goats’ cheese as you go. 6. 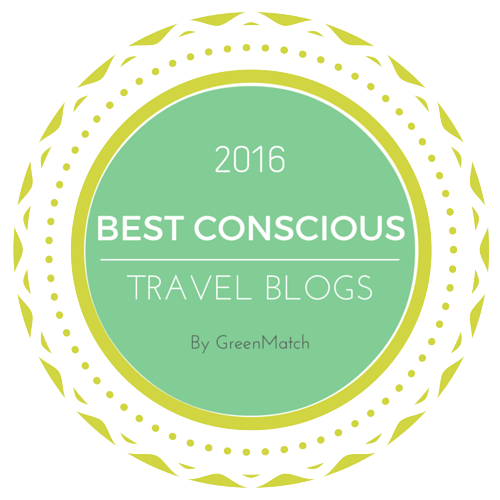 In a small bowl, mix together the breadcrumbs, parsley and parmesan. Scatter the breadcrumb mix on the top, and bake for a further 10 minutes. 7. Slide carefully onto a plate and serve with a bit of greenery. 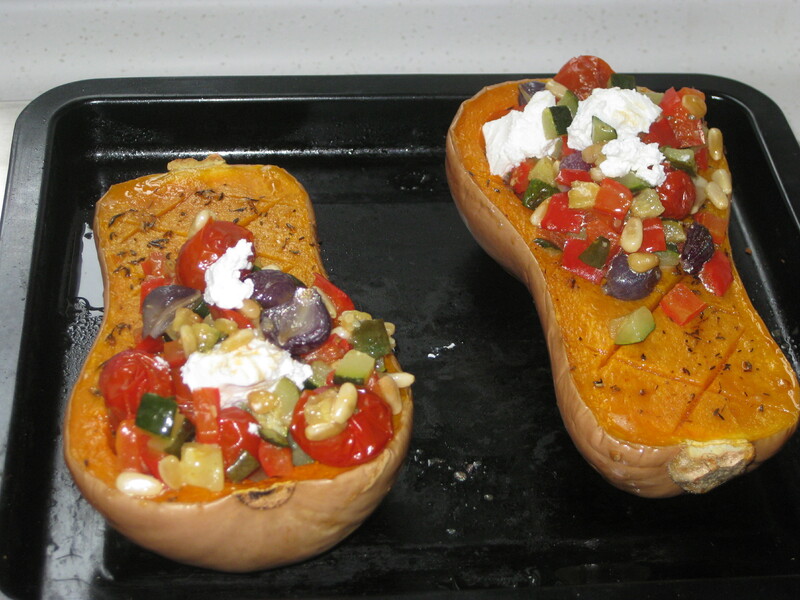 This entry was posted in Vegetarian Recipes and tagged roasted butternut squash, stuffed vegetables, vegetarian dinner. Bookmark the permalink. It looks fancy, I agree. I did something similar but with an eggplant. I am courious how it will taste with a Squash. 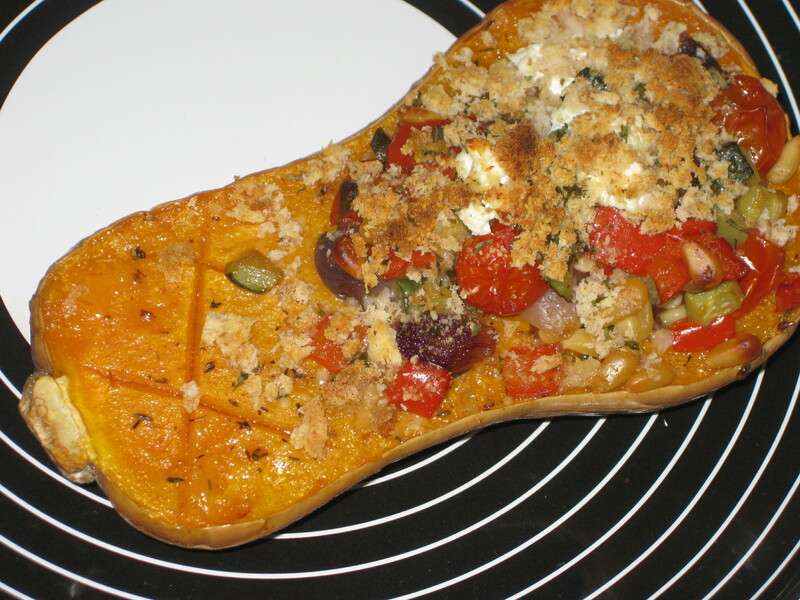 I could eat butternut squash everyday of the week–especially when it’s roasted. What a beautiful dish!